Secretary General of State of Ministry of Defense, Radu Burduja has met today with a group of experts responsible for the implementation of the "Global Peace Operations Initiative" program. 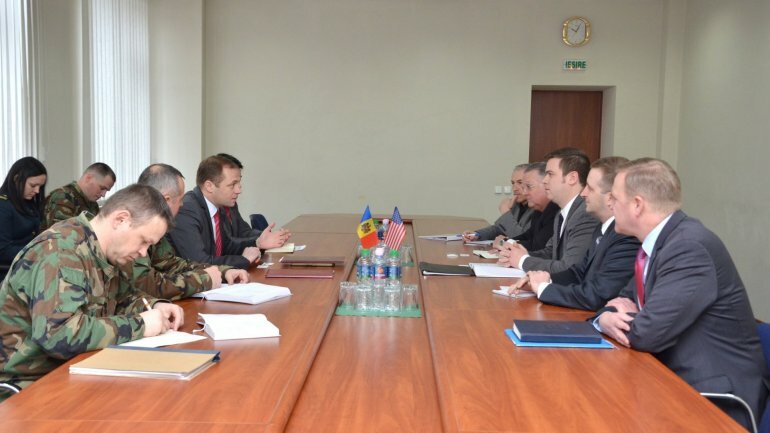 They spoke regarding the reforms and the modernization of the National Army, underlining the current stage of the renovation process of the military base infrastructure, of the National Army, from Bulboaca, financed by US Government within the Global Peace Operations Initiative, as well as the possibility to train Moldova's military for international peacekeeping operations. Radu Burduja mentioned that one of the priorities of the Defense Ministry is intensification of the National Army's participation in peacekeeping missions abroad, aim also stipulated in the strategic defense document. Secretary General of State specified that to realize this desideratum is necessary to improve the training conditions and modernization of peacekeeping subunits, while US partners will offer all the support for this. Radu Burduja has therefore appreciated the contribution of the US Government in the development of the military training capabilities for such missions through Global Peace Operations Initiative. In his turn, Patrick Dolan, responsible for the implementation of the Global Peace Operations Initiative, has declared that US is supporting the efforts of the National Army to develop its capabilities for peacekeeping, in accordance with international standards. The expert underlined that once the military base from Bulboaca is renovated, Global Peace Operations Initiative project will continue to train the subunits for peacekeeping, so that the National Army will be able to contribute at maintaining world peace and stability. It has to be mentioned that the experts from Global Peace Operations Initiative are currently in Republic of Moldova on an official visit, to evaluate how the implementation of the Global Peace Operations Initiative, financed by US government, is progressing. In this context, the National Army's Military base is being reconstructed and modernized. In 2012, Republic of Moldova was accepted as partner within the Global Peace Operations Initiative. Therefore, our country received a 1.6 million US dollars grant. The money are used to develop the training infrastructure of the National Army, which will boost its the possibility to participate in international peacekeeping operations.